Today at 2PM, the Federal Reserve will publish its latest rate decision, in which the FOMC will likely hold the fed funds rate target between 2.00 – 2.25%, and since this is the last meeting with with no economic projections or post-meeting press conference (this changes in 2019, when every meeting will be "live" with a presser) the market's attention will focus on the statement. Some banks, such as Goldman, will be on the lookout for any Fed references to the 8% October sell-off; should these be present it would be seen as a dovish sign of concern about risk assets. 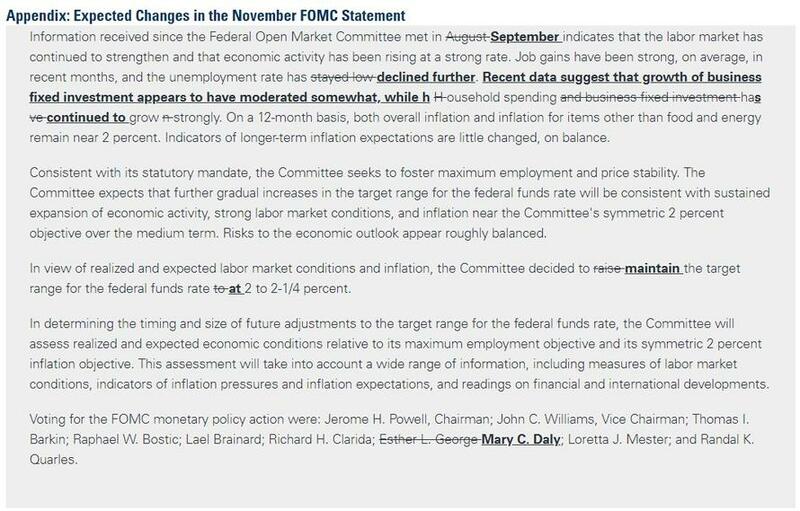 As RanSquawk summarizes, the FOMC is not expected to tweak the federal funds rate target at its November meeting, with markets seeing this week’s gathering as a pause before the Fed delivers a fourth 2018 hike in December. A hike at the next meeting is almost fully priced in, with a markets-implied probability of around 80%. Looking ahead, the Fed now expects three rate hikes in 2019 and one in 2020, with the 2021 dot plot looking for rates to be between 3.25-3.50%, matching its 2020 projection, hinting that the FOMC will put an end date to its hiking cycle some time in 2020. ECONOMY: The incoming data supports the Fed's conviction that the US economy is in good shape; in last week’s jobs report, unemployment held steady at 3.7% and average hourly earnings rose by 3.1% YY - the highest wage growth seen in this cycle (mostly due to calendar affects). On the growth front, Q3 GDP came in at a strong 3.5%. 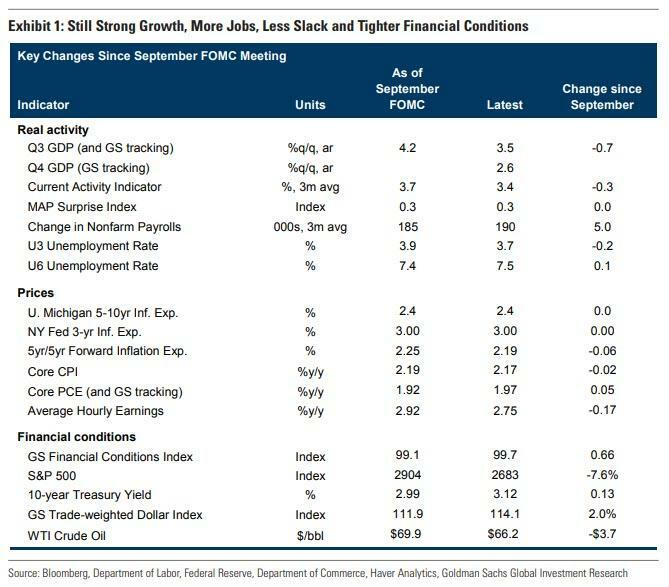 Goldman Sachs believes economic activity will likely continue in this direction, although it highlights that the FOMC may acknowledge the moderation in business fixed investment. In sum, while growth has likely peaked, it remains well above the pace required to stabilize the labor market and the Fed will likely deliver a relatively upbeat statement that sets the table for a December hike. Downside risks remain related to trade war uncertainty as Oxford Economics warns that ‘increasing trade-related supply-chain disruptions are boosting cost-pressures’ with some worried this could cause a ‘late-cycle breakout in wage growth and inflation’, and now forecasting a slowdown in economic growth this year to 2.5% from 3.0%. STATEMENT: There will be no post-meeting press conference, nor will the central bank update its economic projections; attention, therefore, will be on the statement. Goldman Sachs’ analysts will be watching for three main factors: will the Fed allude to the recent market sell-off, after stocks have skidded by around 8% since the September meeting. The bank will also be monitoring what the Fed makes of economic activity, after some metrics recently hinted that momentum was slowing. FINANCIAL CONDITIONS: Goldman will also be monitoring for any comments around financial conditions but doesn’t expect changes on the language around financial developments, which the FOMC has listed as one of the factors it assesses in its policy outlook. “While the Fed has often been sensitive to substantial tightening in financial conditions, we think additional emphasis is on financial conditions in the short statement would send too dovish a policy signal, especially because growth is currently still very strong.” Accordingly, GS expects an upbeat statement.